This was the first Bench Monday picture I took way back in the middle of July. I haven't taken another one since but I think about it. 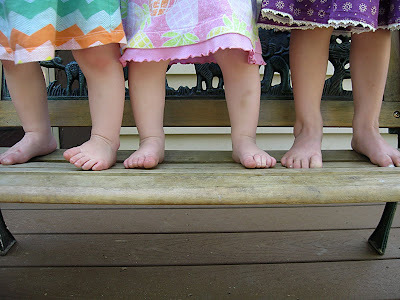 I think of the possible inconspicuous ways I could throw my babes upon a bench in the park, not to capture their gorgeous blue eyes but those scrumptious tiny toes! Or how I could I sneak upon the bench outside our local grocery store, tossing the camera to Madelyn saying, "Take a shot of this, quick! No, no, honey...from the knees down only, please!" It amuses me to dream up these scenarios. Maybe in near future, my dreams of Bench Mondays will come true. But for now, I give you baby toes. Enjoy! For more Bench Monday pics check out the Bench Monday Flickr group! Oh the happiness of baby toes! I love baby toes! My little guy's feet are puffy bricks. I need to capture that. sweet photo! i love those types of photos...the ones that touch a soft spot and stay there. did you make their dresses? sweet!